We are two brothers passionate about the preservation of our engineering heritage and in April 2011 took over the renowned boiler making company Israel Newton & Sons Limited retaining it's former owner Gordon Newton, with his many years of invaluable skill and experience, as a consultant. Having spent most of our childhood (and probably too much of our adulthood!) 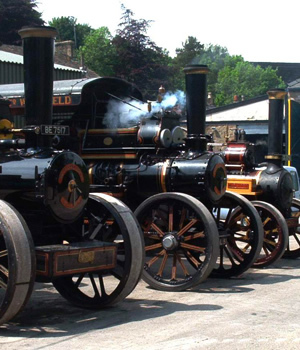 involved in the sooty world of steam we have, over the last 25 years, gained a vast amount of knowledge and expertise in steam engine and heritage restoration. We supply a complete boiler service - from the smallest repair through to the design, manufacture and assembly of an entire steam boiler. In fact we welcome any enquiries you may have concerning repair, restoration and / or conservation of any steam boiler. We work with a wide range of materials applying traditional skills and crafts to any project of this type.